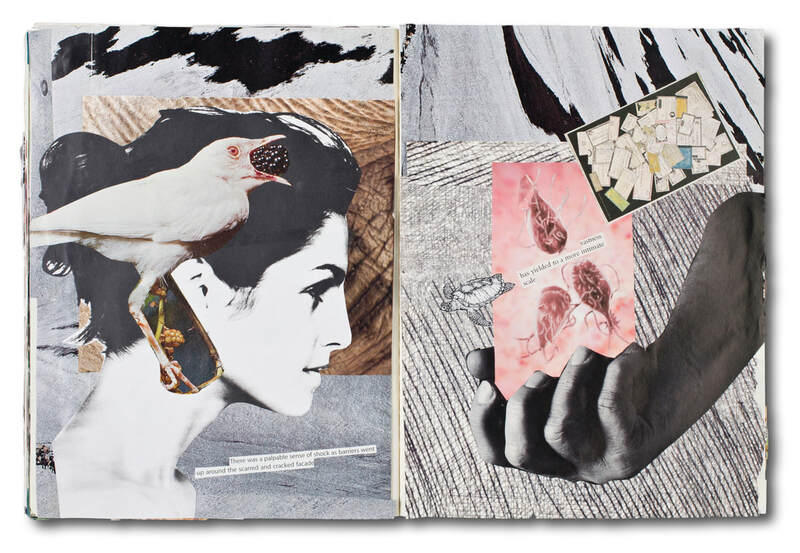 White Bird, 2010, collage journal, 15x10 in. Corinne Lightweaver is an artist, writer, editor, and author. Her artistic journey began in painting, with wildlife as her favorite subject, and also included forays into other media, like ceramics. Later, she began experimenting with collage and assemblage techniques. In addition to creating artwork, she has curated several art and photography exhibits, written about the process of art making, and edited books and articles on the arts, artists, and art conservation. Her book In the Breast of Health: Healing from Cancer through Art is an extraordinary pictorial tour of her journey through breast cancer, in which she exhumed unconscious fears and remapped the changing contours of her body. After her diagnosis, she began using discarded fabric scraps and objects, as well as new methods—cutting, pasting, and piecing—that comprised the best storytelling method for piecing a body and a life together again. In this full-color catalog, her written descriptions of her pieces are as moving as the works themselves. Psycho-oncologist and art therapist Esther Dreifuss-Kattan's forward explains the analytic view of art therapy and puts Lightweaver's work in context. Lightweaver's art is featured in the book From the Canvas to the Couch: Art and Cancer, in which editor Esther Dreifuss-Kattan writes, "Five Los Angeles artists demonstrate how visual art is a powerful tool to address and work through, in a most creative and imaginative way, the multiple losses brought about by cancer. These interesting artistic testimonials—be they in the form of sculptural installations, digital photography, collages, embroidery or comic strip illustrations—can become powerful instruments to fortify psychic life in an attempt to address the intense affects, such as fear, horror and hope, related to cancer and its treatment." Since 1996, Lightweaver's artwork has been exhibited at Cal State University Long Beach, Antioch University Los Angeles, Golden West College Fine Arts Gallery, New Center for Psychoanalysis, Premiere Oncology Foundation, Huntington Beach Art Center, and other venues. Her artwork is held in private collections in Chicago, Tucson, and a number of California locales, including Hollywood, Santa Monica, Venice, Brentwood, Los Angeles, Encino, Costa Mesa, Fountain Valley, and San Diego.